A thought that very frequently occurs to me whilst on a shoot is “what the hell am I doing’. Today this thought flashes before me in neon accompanied by a large firework display. I find myself beside a dark open doorway on a busy pavement in the Akiharbara district of Tokyo. A narrow passage leads to something I don’t fully understand called a Maid Café. I am waiting here because it has become apparent that my lack of Japanese will seriously hinder my venture into this establishment. So I am waiting, waiting for someone Japanese who looks like they speak English, in the hope I can cajole them to act as interpreter on my behalf. Why wouldn’t this work? Five minutes later two rather mature, older men approach, dressed in smart jackets and slacks. They have the appearance of being on a sunday stroll around Hyde Park. I think ‘surprised’ would best describe their disposition when I step directly into their path and garble a polite inquiry as to their linguistic ability. Surprise is replaced by cheerful co-operation and my suspicions are confirmed. Indeed one of the gentlemen owns a property in Maida Vale. Adopting a slightly pitiful pleading countenance I explain my dilemma to them. The passageway leads to a lift. The lift is very small. The two gentleman, my camera and I are wedged within, ascending to the unknown. Our discussions have revealed that we are all uncertain as to the exact purpose of a Maid Café. Conversation in elevators can be a little strained at the best of times but when one is already sweat-soaked and smelly from tromping round a foreign metropolis with a very heavy camera bag, compressed into an elevator that clearly wasn’t designed for 6″3′ (192) westerner and accompanied by two strangers wearing smart sports jackets and no-one is sure if you’re ascending to a brothel, discourse is extremely slow. The door opens to reveal a pink room with tables and a bar. Everything is pink or pink with a white trim; large windows at one end of the room are covered in massive decals of anime figures. This room was not intended for daylight viewing, dim or otherwise, and the dilapidated condition of the tawdry decor is evident. The room is empty apart from one maid who greets us in an extremely high pitched over enthusiastic manner, beckoning us, subserviently, to sit and order drinks. As my new friends explain our purpose her attentive delight is replaced by concern. A small, dour, grey looking man appears from a back room and is consulted, he in turn explains that photographs are not possible without permission from the head office. Using a small map printed on one side of the maid café flyer, he diligently explains the location of the HQ to my new companions before we shuffle back into the elevator and descend to street level, the maids’ shrill salutations still ringing in our ears. And so begins the next leg of our quest: we set forth to find maid café HQ. Together we doggedly search the backstreets of Akiharbara until we eventually we locate the HQ; I suspect my friends might be enjoying the adventure. After broken discussions the management agree that it is okay for me to shoot in one maid café and the model release is fine if I pay for drinks etc. I say goodbye to my friends before heading to the agreed café and setting up a shoot date and time. The good thing about shoots that are prearranged is that everything goes to plan. On arrival the location is ready, the model is prepared, and the shoot goes quickly and smoothly; the release is signed and everyone leaves happy. This is exactly what happens two days later when I arrive with my friend Nick, who has also agreed to model in the images. It is exactly what happens right up until the shoot is finished. Model release in hand, I turn around to secure the signature from the maid. She has vanished. I wait for her to reappear. I wait some more. I make some enquiries as to when she will be returning, followed by some firmer enquiries, and then I start to lose my temper; I demand to speak to Head Office before having have a little sit down to remind myself that anger is unlikely to help in this situation. I calmly stand up and lose my temper. The model has disappeared; the staff in the café are now less than happy with me, HQ are refusing to respond and a group of Japanese businessmen sat at the next table are all making purring sounds as a maid places kitten ears on them and coaxes them into making cat faces. It’s all too much. We decide to leave and cut our losses. The Shot: The main issue with this shoot was always going to be permissions. I spent three or four hours obtaining permissions and even then I knew I would only be able to photograph one maid I wouldn’t be able to include any other people in the shot. The café would not allow me to include customers in the image, and even if I had it is unlikely I would have been able to obtain a release and that may have rendered the image unsaleable. I felt I needed a customer someone for the maid to interact with so I asked my friend Nick to appear as the client. Without a great deal more time, lighting and co operation this shot was never going to be a work of artistic genius so I settled for simply trying to capture images that would represent the maiding procedure and a little of the atmosphere. I learnt a valuable lesson: Always get the release signed first. 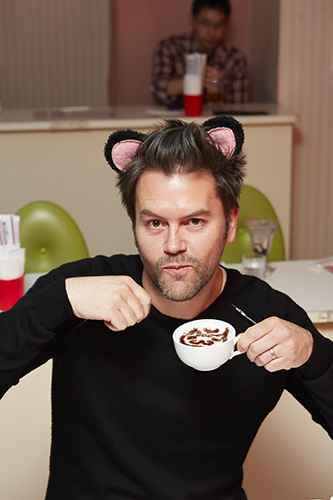 My friend Nick enjoying a maid cafe coffee.